Graduate student Shilpi Bhatia shares her research at last year's Graduate Research and Creativity Expo. Students are vital members of UNC Greensboro’s research community, and next week many of them will share their scholarship with the greater campus community and members of the public. The University’s 2019 graduate and undergraduate expos will take place back-to-back, on April 3 and 4, in a new format designed to showcase the breadth and strength of student scholarship at UNCG. On Wednesday, April 3, graduate students participating in the Graduate Research and Creativity Expo will present their work in Elliott University Center. 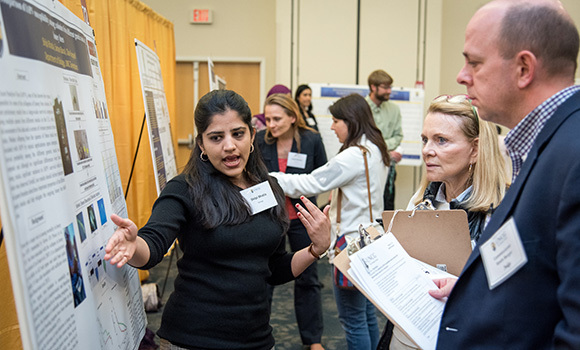 Participants’ posters and presentations will be judged by community members, and 15 student researchers will receive $1,000 awards for their accomplishments. The students will also help represent UNCG – winners from last year’s graduate expo spoke to legislators at the General Assembly’s Graduate Education Day. On Thursday, undergraduate students will step into the spotlight, sharing their scholarship at the Carolyn & Norwood Thomas Undergraduate Research and Creativity Expo in the same location. Participants will present their work – spanning fields from math to music and beyond – through a variety of mediums including posters, oral presentations, exhibits, and scholarly performances. Three undergraduate winners will be chosen in each of the expo’s five major categories. Visit the Undergraduate Research, Scholarship, and Creativity Office website for the full schedule of presentations. The expos, which are open to the public, will be a celebration of UNCG’s vibrant scholarly community. All are encouraged to attend to support UNCG’s graduate and undergraduate researchers.